Well - I got the boot today. No, I wasn't kicked out of anywhere. I literally got the boot. I mentioned in my last blog that I fractured a bone in my foot when I took a tumble down the stairs. The doctor put me in a boot to help the healing process and keep me from having to have surgery if that piece of bone decided to move around. I said, "Absolutely" to that one. How does this figure into Thankful Thursday? Let me list all the things that I am thankful for in this predicament. *I didn't hit my head - pretty miraculous really. When I see where I fell and where I landed, I really do not know how I didn't hit my head. *I didn't break anything - just a fracture. My legs and my arms are good to go. 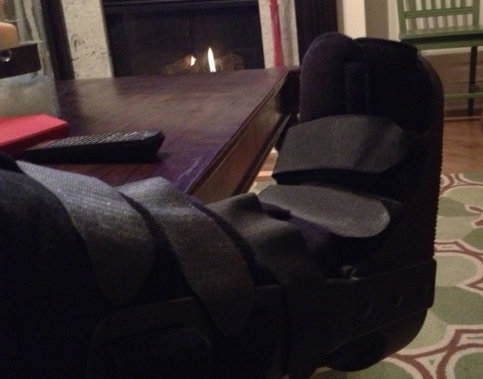 *I can still somewhat get around in this boot. It is protecting my foot. That is a good thing. *I have met some really nice people at the doctor's office and they have given me excellent care. I have a new internist, foot doctor, x-ray technician, blood drawer and many really nice nurses. * I have had some amazing time with the Lord since this happened. I am forced to be still (at least more so than usual) and I have used that time well. I have enjoyed long, lingering, quiet times, prayer times and Bible study. *I love having people over to my house . . . perfect. No matter what the circumstances, there are always many things to be thankful for. Sometimes, we are just thankful for what didn't happen. I am eagerly anticipating what the Lord is going to do with this time. He is whispering to me that He has some things to tell me and to teach me. I'm embracing that with everything I've got. I'm thinking that what I learn during these next few weeks will be really important for all those things I will be getting back to when I have two well functioning feet. I will have to agree with Paul, "I have learned to be content in whatever circumstances I am." Well, maybe that should be "I am learning . . ."
So - this Thankful Thursday - I am truly thankful for the boot. Chrisann, I love city chat. It's either a great source of encouragement, a loving reminder to keep working on ourselves, an ever changing story we can all relate to, and above all......It's your voice I hear and love! Keep it up, you never know who might be stopping by to just take a quick peek and decide to visit more often! Thank you, friend! That is so encouraging to me. Love you.